The dead include women and children. Assistant commissioner Paul Steele said the incident was "tragic" but that there were no ongoing safety concerns. Mr Steele called the discovery "heartbreaking" and said the tragedy would send a ripple through the wider community. It was the country's worst mass shooting since 1996. 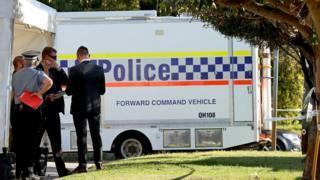 Police treated it as a murder-suicide, saying resident Peter Miles killed himself and six relatives, including his four grandchildren.